Set in the 1980's a college student Samantha, has found the perfect apartment and only needs to earn the money for the rental agreement. After finding a local advertisement for a babysitter, Samantha is offered and takes the job coinciding with a full lunar eclipse. Once at the reclusive house, Samantha is told that she only needs to relax for the evening, but once the couple is gone events lead to Samantha realizing the couples true agenda. 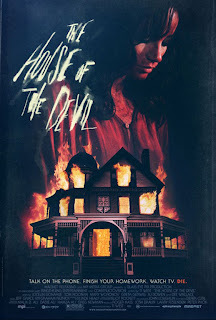 Ti West's "The House of the Devil" is a nostalgic throwback to 1980's horror. The film breaks no boundaries in the genre, but instead weaves a delightfully dark tale that delivers some solid fright and a captivating finish. It has a unsettling tone from the start that is delivered with a childlike perception, leaving the viewer only to feel the pressure build throughout the film. Writer and director Ti West deserves a ton of credit for creating this enjoyably frightening film. "The House of the Devil" nails the period vibe from the look and feel of the 80's in every way. From the overall quality of the print, to the intro credits and finale credits you feel as though you are watching a 80's movie. The soundtrack is perfect, as is all of the props and wardrobe used throughout. West was flawless in his design of creating a superior period horror film. Ti West created a script that, while it doesn't have too much going on, is perfectly structured to tell his threatening Satanic story. The script is not over polished or extremely detailed, instead it is very simple and feels natural. The dialogue and actions that transpire help to deliver the natural and realistic story, which ultimately doesn't seem too far fetched (compared to other horror films). I really liked the fact that West created believable characters that do not perform all the cliche horror decisions (that we see more times than not in horror), but instead make decisions that once again felt natural. "The House of the Devil" while only being a 95 minute film does move a bit slow. The first two acts of the film really have very little going on. That said, I still enjoyed the hell out of the setup. I think that West's ability to create intriguing characters while also throwing me back into my childhood and the 1980's was pristine. Not to mention that the eerie and unsettling tone lurking during the setup, only to come into full fruition by the finale, is absolutely stellar. The performances in "The House of the Devil" really do help to draw the viewer in and are what, in the end, make the film that much more enjoyable. Jocelin Donahue is everything you could have asked for in a leading lady as Samantha. She reminds me of what the classic scream queens like Jamie Lee Curtis or Heather Langenkamp were in their iconic roles. Donahue enters as a unsuspecting college student and progresses into her role just as you would hope. West was very smart in casting both Tom Noonan and Mary Woronov as the elderly couple who have hired Samantha as a babysitter. Both do an fabulous job in their roles and Noonan is masterful as the creepy Mr. Ulman. Noonan's voice and demeanor alone are enough to produce chills up the spine, but combined with West's quality script, Noonan delivers an unblemished performance. The third act to "The House of the Devil" unfolds rather quickly compared to the slow start, but the viewer gets what they paid for. The finale isn't entirely all that gory, however the message is delivered with just as much impact. West also pens a finale that should leave a majority of the viewers questioning just how the story will finish. Which in the end, is a nice change to a genre that has generally become far too predictable. Lastly, the threatening conclusion will have your jaw dropped into your lap and begging for more. "The House of the Devil" is available now OnDemand and will release in theaters on Halloween. If you are a fan of horror, particularly 80's horror, don't pass up a chance to watch Ti West's "The House of the Devil" it is well worth it. Finally, while Ti West did not break the mold with his throwback horror, he did make me a follower of his work. West has a wonderful vision for horror and I am excited to see what the director will do next with his talents. If you get a chance, see "The House of the Devil".